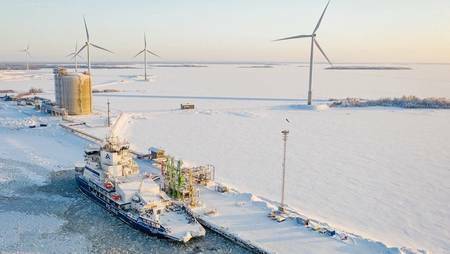 The world’s first LNG-fueled icebreaker, Polaris, received liquefied natural gas (LNG) fuel in January from the Pori LNG import terminal and in February from the Manga LNG terminal located in the Röyttä Harbor in Tornio, Finland. The commercial use of the Tornio import terminal begins this year, said a press release from Nordic gas company Gasum. The gas and fuel market of Northern Finland will diversify as the commercial use of the Tornio import terminal begins this year. Access to LNG is an important competitiveness factor for current industrial operators in the area as well as for the Port of Tornio. The terminal is intended to meet industrial as well as land and maritime transport needs. “LNG is excellently suited for use as a marine fuel as it's a great alternative to oil, and being environmentally friendly is one of its strengths. We’ve already supplied LNG for northern ports such as Luleå, Sweden, and Kemi and Oulu, Finland. Polaris is the first vessel bunkered in Tornio. The start of the commercial use of the Tornio Manga LNG terminal strengthens Gasum’s LNG supply chain in Northern Finland and Sweden for industry and maritime transport,” says Tommy Mattila, Sales and Marketing Director, Natural Gas and LNG, Gasum. Gasum, which is building a bridge towards a carbon-neutral society on land and at sea, said that LNG is the most environmentally friendly maritime fuel. LNG meets the requirements set by the Sulphur Directive regulating shipping emissions as well as the stricter emission limits to be applied in the future. It does not contain sulfur and its combustion generates 87% less nitrogen oxides. In maritime transport, the in-use carbon dioxide emission reduction achieved is at least 9% compared with marine diesel. Its fine particulate emissions are also minute. LNG can also be used to replace the use of petroleum-based fuels in industry, energy production and heavy-duty road transport. The use of LNG also enables a switch to liquefied biogas (LBG) without any additional investments. Gasum has an LNG production plant and terminal in Risavika, Norway, LNG terminals in Øra, Norway, Lysekil, Sweden and Pori, Finland. Gasum is a joint-venturer in the Tornio Manga LNG terminal with Outokumpu, SSAB Europe and EPV Energy.